The Parkhotel Krone is a family run hotel which is steeped in tradition. Situated directly in the climatic spa area, Bensheim-Auerbach on the Hessian Bergstrasse, the spring garden of German wine. Around 22 kilometres south of Darmstadt, 35 kilometres north of Heidelberg and with only 18 kilometres to the town of Worms, the nearly 400-year-old “Krone” (crown) is a historic hotel at the gate to the Odenwald in the historic Nibelungen Land. The central location of the hotel serves as an optimal starting point for hikers in the closely situated Odenwald and Bergstrasse with gems to be visited such as the Felsenmeer, Michelstadt, Erbach and the World Cultural Heritage Site Lorsch Abbey. The Neckar metropolis Heidelberg is only half an hour away by car. On the way, the many wine-growing villages with an abundance of timber framed buildings tempt you to stay a while. You can reach us by car from all directions using the Autobahn A5 – exit 29 Zwingenberg/Bensheim-Auerbach. Follow road signs direction Bensheim-Auerbach. Turn left at the first traffic lights. Follow the road to the next traffic lights and turn right onto the B3 towards Bensheim-Auerbach. After approx. 2 km the Parkhotel Krone can be found on the right directly at a junction. The public car park is behind the hotel. Turn right onto the car park directly after the hotel. The Fuerstenlager, one of the Hesse’s 10 largest parklands, is worth paying a visit as well as the popular castle in Auerbach, which has a superb 360-degree view from the Odenwald towards the Palatinate Forest, all the way to Frankfurt. Travelling for business is a pleasure with excellent connections to the A5 and A67 motorways and Frankfurt Airport being only 30 minutes away. The public car park offers sufficient free parking. Well-known companies such as Suzuki, SAP, TE connectivity, Mettler Toledo, DentsplySirona, AVL, Synventive, Laetus, Alnatura and many more are located within a 5km radius. Auerbach ist mit etwa 10.000 Einwohnern der größte Stadtteil der Stadt Bensheim an der Bergstraße im Kreis Bergstraße in Südhessen. Auerbach (früher Urbach) war jahrhundertelang eine selbstständige Gemeinde und wurde erst 1939 nach Bensheim eingemeindet. Der Name leitet sich von dem Flüsschen Auer ab, das aus dem Odenwald kommend über den Winkelbach dem Rhein zufließt. Bensheim-Auerbach liegt am Fuße der höchsten Erhebung des Odenwaldes dem Melibokus und des Schlossberges Auerberg an der schönen Bergstraße im Süden Hessens. Wir sind der zweitwärmste Ort Deutschlands, deshalb nennt man uns auch die „Riviera Deutschlands“. Seit 01. 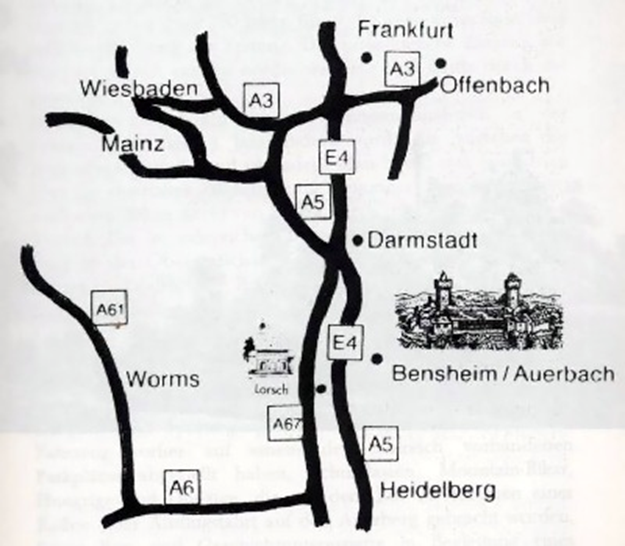 April 1939 ist Auerbach ein Stadtteil von Bensheim und seit 1955 staatlich anerkannter Luftkurort. Heute ist Bensheim-Auerbach mit ca. 10.000 Einwohnern der größte Stadtteil der Stadt Bensheim. Zu den Sehenswürdigkeiten in Auerbach zählen besonders das in der ersten Hälfte des 13. Jahrhundert erbaute Schloss Auerbach mit der Waldkiefer, sowie das ab 1790 von den Landgrafen von Hessen-Darmstadt als Sommerresidenz erbaute Fürstenlager. For hundreds of years, the fate of the “Krone” has been closely connected to the fate of Auerbach. After the Peace of Westphalia in 1648, trade and commerce began to flourish again along the Bergstrasse. The roads were bustling with tradesmen and their wares were transported to and from the town. For those on the road, accommodation had to be provided, travelling wasn’t quite what it is today. There were virtually no inns for the travelling tradesmen along the Bergstrasse and after the devastating war period there were insufficient funds to build any. That help was needed was soon recognized by the far-seeing Landgravine Sofie Eleonore, wife of George II of Hesse. She bought a house, stable, garden, vineyard and field from a resident of Auerbach named Stoll for the cash sum of 1250 guilder and had the “regal hostelry of the golden crown” constructed. 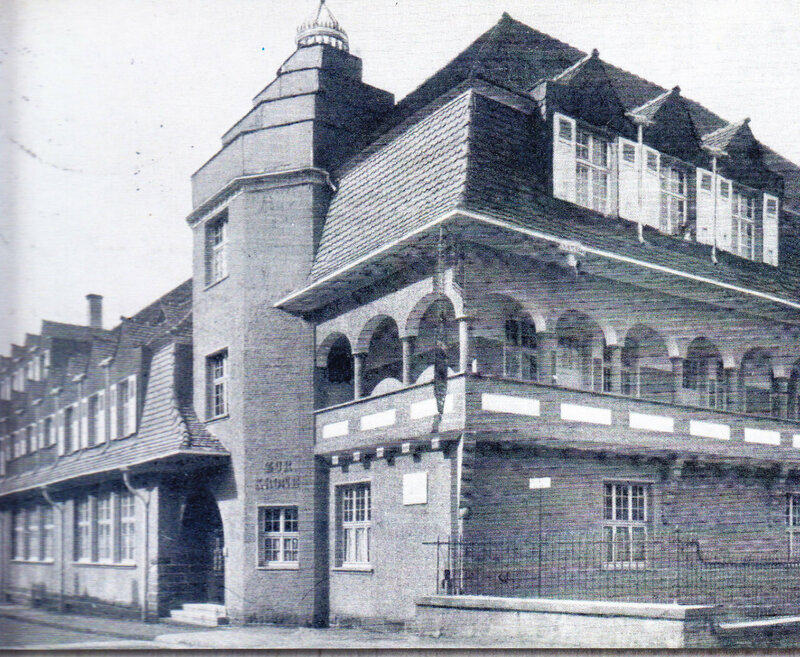 The foundation stone of our hotel, known today as Parkhotel Krone, was laid in 1655. 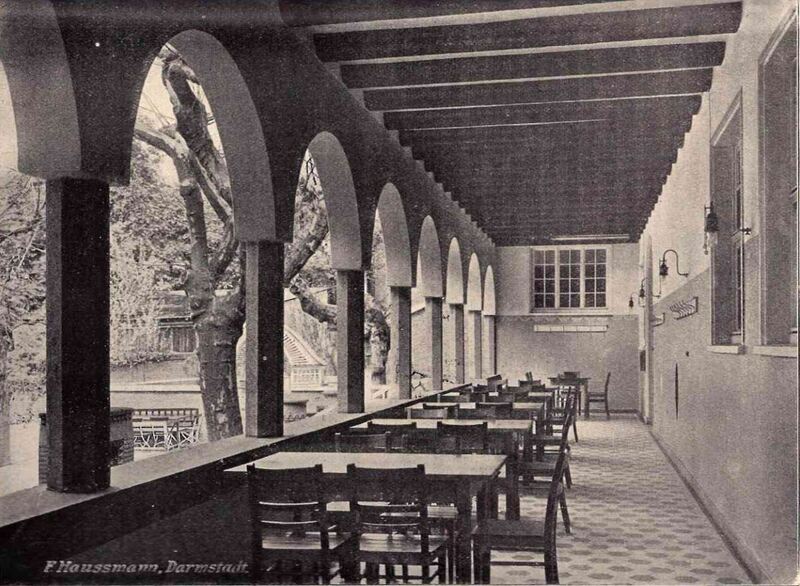 After completion, the hostelry was leased, which brought certain privileges with it. Initially the leaseholder of the “Golden Crown” had the sole rights in the village to the inn, butcher, brewery, distillery and bakery. It was furthermore allowed to run a casino. The building was also protected by right of asylum, which meant that nobody could be arrested. Over the course of time and with each new lease, these exclusive rights got lost; the casino was prohibited in 1818. The discovery of a mineral spring in Auerbach at the beginning of the 18th century was cause for the landgraviate court to relocate its annual summer quarters to the Fuerstenlager by Auerbach. This soon helped the Krone establish its reputation. In Year 1717 the house and farm of the landgraviate administration were first assigned as a “heritage loan” to a member of Family Diefenbach. The first “owner of the entailed estate” was Johann Melchior Diefenbach. 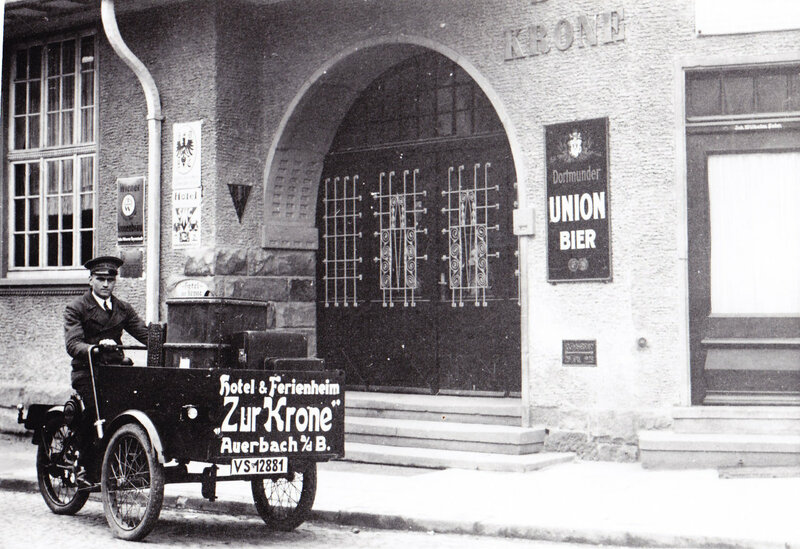 The Krone stayed in the same family for 206 years and was always passed on from parents to son. No other such case can be found in Germany’s hotel industry. Our hotel has born witness to multiple changes in the years of its existence. Such as during the first 150 years, its prosperity was mainly thanks to the mineral spring in the Fuerstenlager. Later when the spring had slowly lost its prominence, travellers and goods transport along the Bergstrasse became important, which developed in the course of time. Besides living quarters for travellers and buildings for carriages, stables for over 100 horses were required. After Germany’s release from Napoleon’s reign came a peak of travelling along the road. The owner of the estate at the time Joh. Georg Diefenbach could bring the long lease into his own possession for a single payment of 2992 guilder. Astonishingly, at this time a discovery of which the 19th century is particularly proud and which promoted trade and dealings and todays great travel possibilities in unforeseeable measures: the invention of steam power and its utilisation of the transport industry which was nearly the deathblow for our hotel. In the same measure, at the beginning of the 19th century, steam ships travelled increasingly along the Rhine, causing the traffic along the Bergstrasse to reduce. When in year 1846, the railway line Frankfurt-Heidelberg was launched, movement along the road reached its end. Rooms, halls, and stables in the Krone, all stood empty and silent. Auerbach didn’t even have its own station. No wonder the owner of the Krone at the time sought to sell his property at any price. A buyer was actually found who took it on for 12000 guilder. Due to the stagnation of movement along the road, he could only hold his ground for a short time and the previous owner took over the hotel again. Another ill-fortune of political unrest came in the years 1848-49. Our hotel bore witness to moving times with interesting outcomes within its walls. While in Baden, after the rejection of the emperor by Friedrich Wilhelm IV. of Prussia, an attempt was made to forcibly impose German constitution and the government in Karlsruhe was overthrown, in May 1849 a large number of officials from Baden came to Auerbach to await the further development of events in Baden or to withdraw from military service of the revolution army. Among the visitors were court trainee Viktor von Scheffel, the subsequent Minister Jolly, Professor Heuser as well as the whole of the Bendersche institute from Weinheim with all retirees. The four corners of the large ballroom were furnished as a schoolroom for the institute. For two months, the buildings were packed to the rafters and the singing of Viktor v. Scheffels cheery and boozy party could regularly be heard until the early hours. Some of the beautiful songs such as: “Als die Römer frech geworden” (“when the Romans became cheeky”) were penned by Scheffel’s own fair hand. Expelled from his home, several weeks in May and June 1849. To honour the memory of Scheffel in 1899 The residents of Auerbach. In 1851, Auerbach finally managed to have a railway station constructed. The grand duke’s court again began its regular annual visits to the Fuerstenlager for a longer period of time. As a result, the hotel faced a new task, tourists and the accommodation of summer visitors for extended stays. In 1884 Johann Georg Diefenbach took over the Krone. He was co-founder of the present spa and tourist office and the road “Diefenbachweg” was named after him. 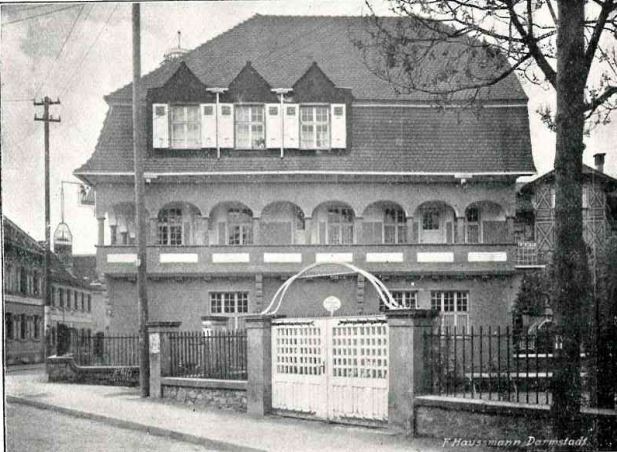 In 1885/86, he extended his hotel with Villa Erika and the Schweizerhaus which had a large ballroom on the ground floor and many contemporarily furnished guest rooms. One of the best known and best managed hotels in Hesse. 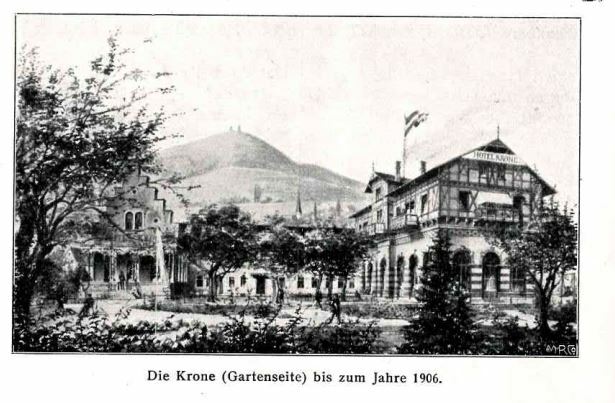 After many years of hard work and the fortunate negotiation of the completely altered traffic conditions, in 1906 the hotel was back in favour with its many visitors and friends, when it was suddenly hit by an unfortunate event in which the old “Krone” disappeared overnight almost without a trace. It was a glorious Sunday, 30th September 1906. 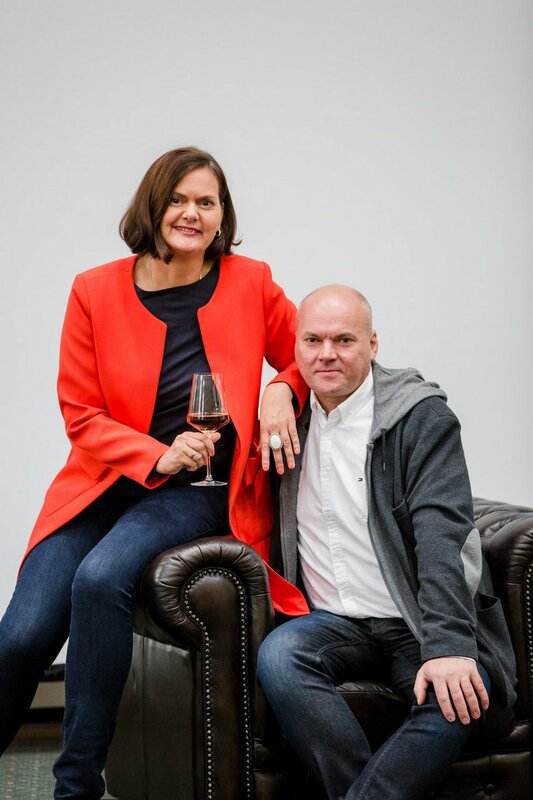 The Hotel Krone was enjoying a busy day with many visitors, 2 days later a large wedding reception for a family from Weinheim would take place and later that week a seminar organised by the Association of the Friends of Young Women chaired by Princess Marie von Erbach-Schönberg. During the night from Sunday to Monday, the alarm bells rang from the church tower. Long into the night a sea of flames blazed and within only a few hours, the old “Krone” was only rubble and ashes. So, after centuries of efforts, trials and tribulations everything was destroyed in just one night. There was no time to rest, the “Krone” had to be rebuilt as soon as possible and already on 19th October 1907 the celebratory opening ceremony took place. 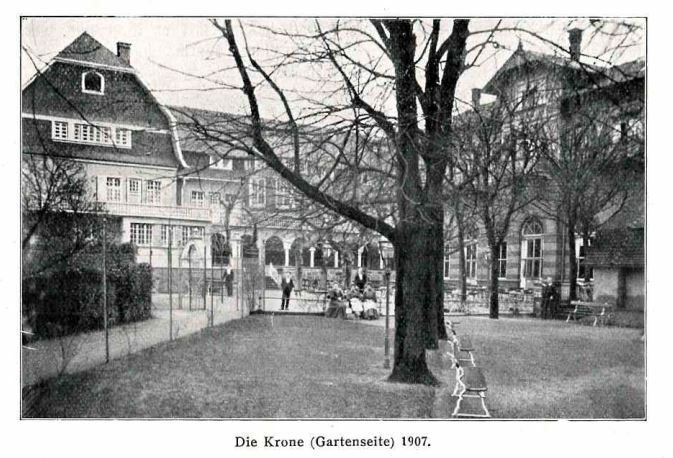 Although the construction of Hotel Krone in Auerbach provided the supervising architect, Professor Georg Metzendorf, with an awkward task, which he solved admirably. Not only the use of the land but also the financial means were particularly limiting. The homely cosiness, which the old building embraced took on new measures in the new building. It was also brought technically up to date. The hotel was furnished with glass and electrical lighting, bathrooms on each floor, water closets and modern sanitary facilities. 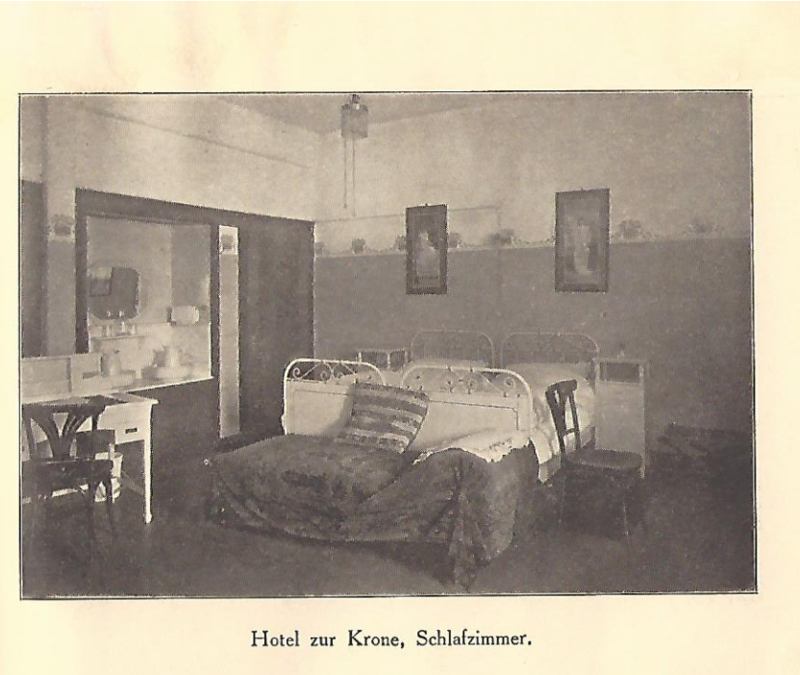 The guest rooms were nearly all heated seeing as the new Krone had central heating which also kept the whole hotel pleasantly warm throughout the winter. Telephone, garage for cars and dark room are available. On 1st November 2012 family Matas took over the hotel after it went into administration yet again. Since then the hotel has been family run. Mr and Mrs Matas make a good team in the traditional hotel. Stan Matas is a skilled carpenter and runs a construction company. Peggy Matas is a qualified hotel manager, master of her profession and also studied hotel management administration. Both complement one another very well and with the help of the whole team, the Hotel “Krone” shines in new splendour. Our Restaurant open 15:00h bis 24:00h.